Blog - Debabrata Behra, An artist who dances with his feet, paints with his hands and does both with all of his heart and soul! 25 year old Debabrata Behra (fondly known as Debu) from Indiavaale is a Pattachitra artisan and an Odishi classical dancer. "My father is a fisherman /farmer, while my mother is a housewife. I have two brothers - the elder one works in Bangalore & the younger one studies in our village. As a norm, I tried farming with my father but my heart was never in it. Dance is my passion, an extension of my soul. Even as a child, Iwasalways mesmerized by the dancing programs held in my village. Unfortunately, there was no dancing school in our district. Five years ago, I saw an ad of a government organized local dance program inviting students to learn classical dance. I seized the opportunity and never looked back.The art of making Pattachitra runs in my family naturally. We would acquire small Pattachitra painting jobs to afford dancing classes and subsequently spend all my earnings in learning Odishi Nritya.Pattachitra requires a lot of patience and effort.We artisans prepare the canvas and colour dyes using natural ingredients. The preparation process alone takes us 5 days. It isn’t easy; long sitting hours result in chronic back & neck pain in many Pattachitra artisans. I wish that fellow Indians were more aware amd appreciative of Pattachitra artwork. Foreign residents are very encouraging of our work. I wish more people support this art form and save it from dying." In Sanskrit, 'Patta' means canvas and 'Chitra' means picture. The art traditionally practiced in Odisha since generations, celebrates the stories of Lord Jaggannath, Radha-Krishna & Ramayana. The artworks are prepared with colourful imagery with intricately painted details. 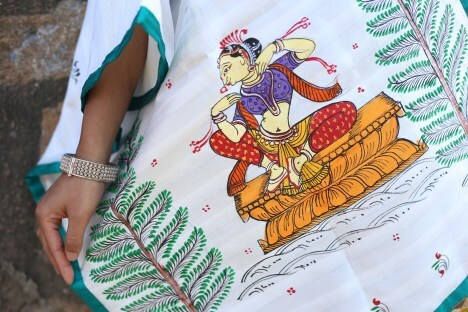 Debu and Indiavaale are working hand-in-hand to adapt Pattachitra artwork in products that are relevant. He is the creator of their Pattachitra dupatta & scarves collection and is very receptive to evolving his craft. Debu has recreated many profound themes from his imagination on these dupattas and scarves ranging from the divine love of Radha-Krishna to Vichaar Magna Yuktis. www.eminentcraftbook.com is a premier online magazine for craft lovers. A venture of Eminent Craft, they focus on stories of the artisans behind the products.